Christmas Eve starts early in the tropics, with a dawn wake-up call from the birds and the ocean. I peer out from the curtains and see wild water and an overcast sky – or is it just that the sun is not properly up yet? But there is no lounging about today. We have jobs to do. Expecting bad pre-Christmas traffic on the narrow roads we leave the car behind and stand out on the street to hail a ZR. There are three ways to get around Barbados by public transport: a regular bus, a regular taxi and a ZR (so called for their ZR number plates). These privately owned route taxis ply their trade to and from Bridgetown on pre-determined routes, picking up more passengers than you could expect to fit in such a small mini-van. Technically there are eight seats in the back and two in the front (including driver) but it is not unusual to have fifteen or more paying passengers along with the driver and money man. ZR drivers are known for their enthusiastic driving styles and loud music, so it’s an entertaining way of getting about. Passengers, on the other hand, sit quietly and politely, squeezing into more and more impossible spaces to let another person sit, all without comment, frown or smile. It’s the Bajan way. We stand on the roadside beside a young man who greets us politely and formally, like all Bajans do: “Good morning and Merry Christmas”, he smiles. Soon he is picked up by a friend in a new 4×4, leaving us to our fate in the ZR hurtling towards us. I sit between an elderly lady dressed in an impeccable mint-green frock with matching bag, shoes and gloves and a friendly tourist bloke from the north of England who is off to Dover beach for the day. He tells me the most he has seen in a ZR is twenty. I forget to ask him if that includes the driver. We crawl through unusually busy traffic as the sound system cranks out some excellent soca tunes, all of which are Christmas songs with hilarious storylines. Men complain about being made to clean the house before Christmas and the wife’s family eating him out of house and home. Women sing of a turkey and ham feast, presents under the tree and a home full of happiness. Two sides to every story I suppose. The bus station is right by the market and we weave through the crowd. A man sells Christmas CDs out of the boot of his car. A woman around my own age sets up a jewellery stall for all those last-minute boyfriends. The busiest stall is the fresh bread. Left alone for an hour I wander down into the city centre looking for a pharmacy. Most shops are blaring Christmas music of one type or another (although you won’t hear White Christmas or Winter Wonderland here) and there is plenty of last-minute shopping being done. The venerable Cave Shepherd department store has been doing business on Broad Street in Bridgetown since 1906 and is crowded with locals and tourists. The toys and books department is doing the most business, along with the beauty and perfumes department right inside the door. Down the street I am surprised to see Bridgetown’s new Tiffany’s store in the fancy Colonnades shopping mall, although it doesn’t look too busy. I turn down the back streets and find my way to Swan Street, a narrow pedestrian thoroughfare crammed with shops, mini-malls, street vendors and shoppers. Think Dublin’s Henry Street or London’s Camden Town. Barbados is the only place I have seen outside Mexico whose stores display female mannequins with the rear end facing out, the better to see how well these trousers/that dress will show off your rear end. A few women sit at stalls shelling peas, selling bags for $8 (US$4) a pop to those too busy to prepare everything from scratch for tomorrow’s feast. The occasional shopper hurries past with a Santa hat at a jaunty angle and a Christmassy brooch on her top. I take a quick look inside a $3 shop. These everything-at-one-cheap-price shops are fascinating to me, a handy cultural barometer of any town or country I visit. I am always interested in the range (or otherwise) of goods on sale, indicating both availability and demand. Today I find last-chance red Christmas bows for doors and windows, a decent choice of cheerful Christmas crockery, a mundane mix of dried goods from long-grain rice to cake mix, some quite lovely wrapping ribbon and the usual wall of kitchen items you never thought you wanted. A few doors down in a mini-mall, Warren the roti man shares a shop with a Chinese buffet. It is about a dollar more and 30% bigger than the Chefette all-beef roti, which is my favourite snack here. But he’s a small local business and his food smells good. I get a beef and potato roti with a choice of plain or dhal puri roti. He adds a dollop of chilli sauce before the beef and potato mix goes on. It’s expertly wrapped and handed to me in moments. I peel away the paper and start nibbling carefully lest the bread gives way. The filling is bordering on the wet side for something being held together with a thin piece of pastry, but it’s just delicious. Warren looks over anxiously, gesturing a question: do you like it? Is it ok? I roll my eyes happily, smile and give him a shaky thumbs up. This is really good food. The ZR trip back to our lodgings is more eventful than usual. One young lady breaks all protocols and attempts a loud and disgruntled conversation with the driver, with whom she appears to be unhappily acquainted. I can feel her fellow passengers stiffen. After a quick survey of the final destination of each passenger, we take a wild detour from the usual route, trying to avoid the Christmas Eve traffic. I enjoy house-watching from my window seat: there are some lovely big houses down these back streets that I hardly ever get to see. When we end up down a cul-de-sac courtesy of another passenger’s directions, our rowdy neighbour laughs raucously. “He tells us to go past his house, but he don’t know where he live!” The other passengers hide their smiles and try to maintain the decorum required of them. Back on the balcony the sun stays mercifully behind the clouds as I sip a nice cup of tea and dunk a couple of ginger nuts. The waves are still wild but we venture in for a dip as a procession of airplanes descend overhead towards the airport: Virgin, Thomas Cook, American Airlines, Iberia. These people are leaving it a bit late to reach Paradise in time for Christmas. My candle is lit on the balcony although it is not quite dusk yet. The Irish tradition of the candle in the window on Christmas Eve is one I treasure from my childhood, and one I have upheld in every home I have had. Mary and Joseph will know there is room for them in our two-bedroom apartment if they happen this way and are turned away from the inn. It might be the longest night for most in the northern hemisphere, but to us it is the shortest night. Determined to wring every last drop out of a brief New York City visit, we book late night tickets at the Blue Note to see Chris Botti, and get back to our hotel less than three hours before our wake-up call is scheduled. Bleary-eyed at half past four in the morning, we lug our bags downstairs, say goodbye to the night staff and put ourselves in the hands of the limo driver. An hour later I am sitting in the American Airlines club lounge, Virgin Mary in hand (it’s been an alcohol-laden few days) and a relatively healthy granola breakfast on the way. Orlando has opted for yet more eggs and bacon than you can shake a stick at. At this point it’s a case of whatever will get us on the plane still conscious. We sit slumped in our exit row seats, ignoring Wolverine on the TV and the wonderful American Airlines in-flight service (a polystyrene cup of luke-warm tea is all we are offered in five hours) and fall into a coma. I wake about three hours into the flight and realise it’s almost time to ditch the fur-lined boots and woolly jumper for rather more tropical sandals and fresh linen. 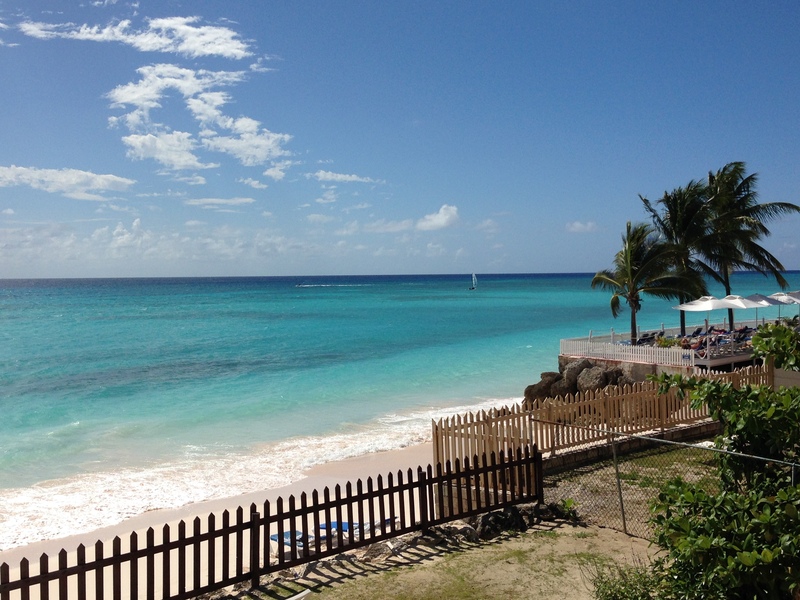 The azure horizon changes and we can see the northern-most tip of Barbados taking shape. I peer out and try to identify each beach as it emerges from the haze. Is that Dover? Or Worthing? Orlando doesn’t care: all he sees is an island he calls home. Stepping out onto the apron at Grantley Adams International, the feeling of warm tropical air on my bare legs and arms is just perfect after two weeks of freezing temperatures, wind chill and thermal underwear. The air is laden with the perfume of the tropics. We scribble our landing cards hurriedly and I follow Orlando to the “Citizens only” booth, avoiding the growing queues of tourists. The immigration lady gives us a formal “good afternoon” but her eyes are friendly. Minutes later we are in the cleanest taxi cab I have ever been in, diverting off the Tom Adams highway and taking the back roads down to Oistins. Beautifully kept concrete homes make way now and again for older, smaller weatherboard homes and the occasional brightly painted chattel house, all equally well presented. Occasionally a verandah or a front door is festooned with Christmas decorations, the tinsel taking pride of place on this sunny island. An odd snowman or penguin ornament looks out of place but cheerful enough in the mid-afternoon sunshine. Finally checked into our temporary home, we stand on our balcony overlooking a tiny beach, miles away from the main tourist centres, and finally start to relax. All we can hear is the sound of the Caribbean Sea pounding just yards from our door. The turquoise and blue of the water hurts my eyes after two weeks of weak winter daylight. A quick visit to the supermarket for some provisions, and just before sunset we finally make it into the water. The day has cooled down somewhat as we dip our feet into what feels like a chilly sea. Orlando dives straight in, whilst I stand and wait for one of the big rumbling waves to envelop me. We bob up and down chest-deep in water, breathing in the warm evening air and watching the colours change in the sky. As the sun sets, a handful of teenage boys play a rowdy game of football nearby on a postage stamp of white sand as we give ourselves over to the water. Later on the balcony the rum punch is strong and the fried flying fish going down a treat: that healthy breakfast seems like a long time ago now. The sun sets quickly in the end, leaving us in darkness with only the pounding of the waves and the trilling of the crickets to keep us company. It’s going to be an interesting two weeks. We awaken early on our last day. From our balcony we can see some early risers take advantage of the low tide and the public holiday, walking and running and long the full stretch of Maxwell Beach from the Uhuru apartment block to the Sea Breeze Hotel. A man limbers up under the coconut palm, stretching his hamstrings and circling his arms vigorously before sprinting along the beach with the energy of a man half his age. Orlando naps on the daybed as I follow the stairs down to the water’s edge. The sun is hot on my skin even though it is not yet seven in the morning. I walk slowly along the white sand to the rocks at the eastern edge of our little cove, then sit and gaze back at the silver surf and the impossibly blue water, wondering how we will ever leave. The day passes beautifully slowly, reading books in the shade of the balcony, a light lunch, another snooze, another leisurely dip in the water. Mid-afternoon, without warning, grey rainclouds approach from the south. The first raindrops give no clue about the coming onslaught, but the rising wind prompts us to lower and secure the balcony blind. The nearby town of Oistins disappears from view, the houses and fishing boats and lighthouse obscured by an opaque grey blanket. Families and groups of youngsters dive delightedly into the water, shrieking with delight and huddling together as the full force of the rain hits. We stand and watch the squall unfurl in fury from the back of the balcony as sheets of rain soak everything around us. The coconut palms in the garden whip angrily from side to side as the sunbathers by the pool run for cover. They are not as relaxed as the locals are about this pre-hurricane season weather. It is over as quickly as it began. The blue water of Oistins harbour come back into view, the wind drops and the sea changes instantly from grey-blue to turquoise again. The sun comes out from behind the steel wall of cloud and the air feels fresher, more fragrant. Hours later we are asleep in bed. It is not yet eleven at night but we are exhausted and we have to be at the airport at five in the morning. We are awakened by a hammering on the window shutters and the floor-length curtains fluttering wildly towards the ceiling. Another storm has hit and the rain is thundering down, blowing horizontally right into our bedroom through the balcony doors we left open for the night breeze. Half-asleep we leap from the bed, rushing to secure the balcony furniture and close the doors against the storm. Locked down again, we lie listening to a howling wind and the rain hammering a tattoo on the aluminium shutters until sleep takes us again. Not even the lightning can keep us awake. In the morning, all is wiped clean. The puddles by the swimming pool and the raindrops on the balcony railing are all that is left of the storm. The sun rises on another perfect day. Maxwell Beach glistens in the early morning light as we take one last long look from the balcony, then turn away. We lock the door behind us and take our bags to the car. The airport – and Mexico – beckon. The apartment was perfect. On the first floor, we were high enough for panoramic views and security, and low enough not to make it a chore to get to the water. 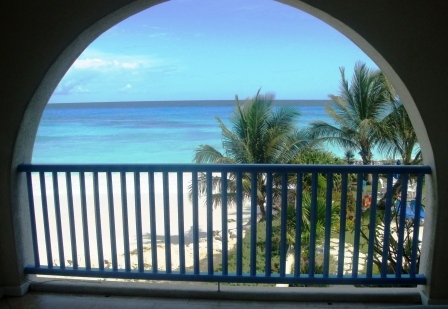 The huge balcony overlooked Maxwell Beach, a tiny strip of Caribbean perfection just – literally – a stone’s throw away. I lounged on the daybed and took in the view: azure blue skies, a handful of nearby coconut palms, a sliver of impossibly-white sand, enormous high-tide waves rolling through the turquoise water to crash into white foam as they raced to shore. Further out, the white sand under the water stopped, and a deeper navy blue indicated rocks or deeper waters. Two women about my own age in bikinis strolled along by the water’s edge. By the colour of their skin they had been here a good ten days, sun-worshipping. A lanky teenager in red board shorts parked his bicycle in the shade and waded into the waves, to cool down in the heat and humidity of the mid-summer afternoon. I picked up a beach towel and made my way down to the water’s edge through the villa gardens. I felt the warmth of the sun on my skin as I took the first tentative steps into the warm Caribbean water. It felt more benign than the harsh Australian sun, which feels more like radioactive waste falling from the sky. I’d forgotten how much I loved the sun. The tricky part was getting past those huge waves as they crashed to shore. Once I had braved two or three, the water got calmer and I stood chest-deep and let the water lift me. It was easy to lose half an hour, an hour, bobbing up and down in those enormous swells, floating rather than swimming, nothing more in my mind than that very moment. 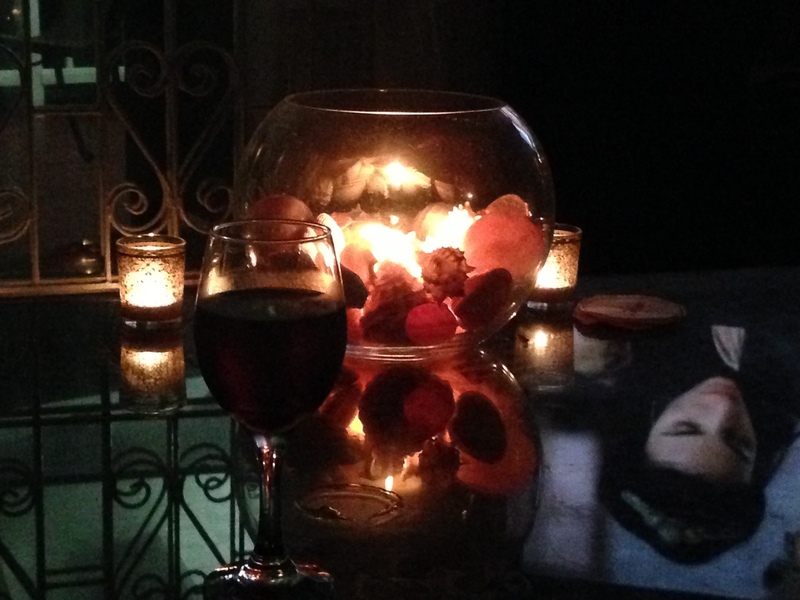 Later, on the balcony, rum punch in hand, I could feel the air was heavy with moisture. The wind was getting up as some heavy rain clouds rolled in from the south, faintly dimming the impossible blue of the sky and the sea for the first time. The first heavy raindrops fell: did I imagine an immediate lessening of the humidity, a freshening of the breeze? The waves crashed even more angrily against the shore. It’s going to be difficult to sleep tonight with this as the soundtrack, I thought. Early next morning, the jetlag awakened me to the sound of the churning waves outside. A bare hint of grey light trickled through a chink in the heavy curtains. It wouldn’t be dawn for at least another hour. I climbed out of bed quietly, and expertly wrapped a sarong around me in the darkness. I padded through the silent apartment, spilling light everywhere as I opened the big American refrigerator door. On the balcony there was just enough light to see a faint greyscale version of the normally Technicolor panorama before me: a handful of monochrome coconut palms swaying in the stiff breeze, a paler grey sea still hurling silver-white waves to the shore. I felt Orlando’s arms around me as he emerged from the bedroom into the weak pre-dawn light. 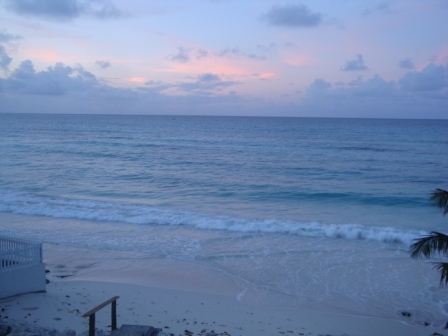 We stood together in silence waiting for the sunrise, and breathed in the tropical air – our first morning in Barbados.